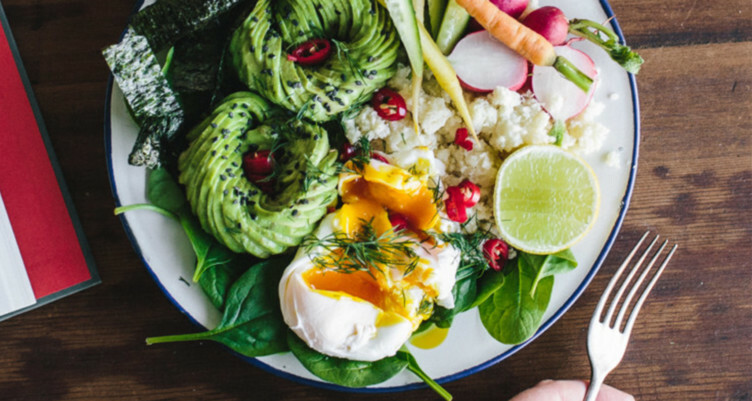 Keto and low-carb diets have become extremely popular, and for good reason: This way of eating provides a number of health benefits, including sustainable weight loss, better blood glucose control, and lower insulin levels, among others. However, there are several myths that persist among the keto community, some of which can lead to unhealthy or disordered eating — exactly the opposite of what a balanced, very-low-carb approach can achieve. Read on to learn about these myths, and where research and experience actually stand currently. Although keto diets fall under the large umbrella of carb restriction, their macronutrient ranges are narrower than low-carb diets. A typical keto diet provides more than 65% of calories as fat and no more than 10% of calories as carbs, whereas a non-ketogenic low-carb diet may provide anywhere from 50-65% of calories as fat and up to 20% of calories as carbs. But is one better than the other for weight loss and other health improvements? It really depends on the person. In studies, weight loss and blood glucose have been shown to improve when carbs are limited to less than 20 grams per day, less than 50 grams per day, and less than 100 grams per day (1, 2). And although many people find that consuming a very-low-carb, ketogenic diet provides greater benefits, some discover that they actually do best with a non-keto approach, especially long term. Similarly, many of us thrive on a high-fiber, low-carb diet, while others can’t tolerate much fiber at all. Therefore, your “net carb” and “total carb” intake may be very similar if you follow a low-fiber diet yet differ by 25 grams or more if you include a lot of fiber on your keto or low-carb lifestyle. Following a keto or low-carb “system” to the letter might help you achieve the results you’re after, but more likely you’ll need to experiment a bit in order to find out what’s optimal for you. Unfortunately, there’s a widespread belief that some whole foods aren’t compatible with keto, even when used in small amounts. This includes certain fruits, vegetables, and dairy products, such as buttermilk. However, this is a misconception. When consumed in minimal amounts in recipes, almost any whole food can fit into a keto lifestyle. Excellent examples of this can be found on The Charlie Foundation website. The Charlie Foundation provides a wealth of information and other resources for children and adults with epilepsy, brain cancer, or traumatic brain injury who may benefit from ketogenic diet therapy. Many of these individuals need to restrict carbs to extremely low levels in order to maintain high ketone levels for neurological health. For example, in the classical ketogenic diet, people eat three to four times as much fat as protein and carbs combined (a macronutrient ratio of 3:1 to 4:1, respectively). For someone eating about 1500 calories per day, this would mean eating about 15 grams of carb, 60 grams of protein, and between 225 to 300 grams of fat per day. Some of our own KetoDiet recipes also contain small amounts of higher-carb ingredients, such as buttermilk in our Sourdough Keto Baguettes, orange juice in our Spiced Orange Cranberry Sauce, and cherries in our Low-Carb Dark Cherry Chia Jam. Each of these recipes contains no more than 5 grams of net carb per serving and can easily fit within a keto lifestyle when included in a low-carb, high-fat meal. In books, online forums, and social media, concerns have been raised that too much protein can interfere with weight loss on keto or low-carb diets. However, this is a relatively new idea and one that isn’t supported by published science or anecdotal evidence. The most common charge being made is that high protein intake leads to gluconeogenesis, a process by which the liver makes glucose from amino acids and other compounds. However, gluconeogenesis is a demand-driven process, meaning it only occurs when your body needs glucose — which under most circumstances isn’t the case if you’re following a keto or low-carb diet and are fat adapted.When carb intake is very low, gluconeogenesis can provide glucose for the few structures of your body that can’t run on ketones (red blood cells and portions of the brain and kidneys), but this in no way interferes with weight loss. If your weight loss stalls on a keto diet, consuming too little fat probably isn’t the cause. When you’re already following a diet that provides than more than 65% of calories as fat, your body will burn any excess fat calories — from butter, cream, oil, etc. — for energy rather than burning stored body fat. Rather than increasing your fat intake, try eating a bit more protein, especially if you’re not getting at least 1.3 grams per kg/0.6 grams per pound of body weight (or ideal body weight if you are overweight). Additional strategies for overcoming a weight loss plateau include changing the timing of your meals, being more active, and making sure you’re not taking in too many carbs or calories from low-carb treats or packaged foods. One of the more pervasive myths within the keto community is that elevated levels of blood ketones (beta-hydroxybutyrate, or BHB) promote weight loss. This isn’t true, as can be verified by people who follow a ketogenic diet for therapeutic reasons, such epilepsy, brain cancer, or neurological issues. These individuals usually achieve ketone levels of 2.0 or greater yet maintain their weight. A high ketone level reflects that fat burning is occurring but does not distinguish whether the fuel source came from fat stores on the body or dietary fat that was consumed. Since a caloric deficit is required in order to lose weight, achieving high ketone levels while eating more calories than your body requires will not help you accomplish that goal. When following a keto way of eating, is practicing intermittent fasting (IF) the best way to maximize weight loss, optimize blood sugar control, and improve overall health? Although this assertion has been made repeatedly over the past few years since IF became popular, this is another area where individualization comes into play. Some people prefer to keep their eating window to 8 or fewer hours by eating two meals, skipping either breakfast or dinner most days. If you aren’t hungry in the morning (or evening) and feel great on only two meals a day, there is no reason to eat breakfast or dinner. IF may very well be a natural fit for you. However, other people prefer to eat three meals a day while following a keto lifestyle. Unlike intermittent fasters, they find that they have better appetite control and more energy when they consume breakfast, lunch, and dinner. Importantly, neither way of eating is better than the other; as stated above, it’s very individual. You’re much more likely to achieve your best results by doing what feels natural to you in a way you’ll be able to sustain long term. Low-carb sweeteners have been criticized by some in the keto community. The most common charges are that these sweeteners trigger cravings for sweets and refined carbs, may cause digestive issues, and that even the “natural” types like stevia and monk fruit are processed products and may have negative impacts on metabolic health. Although these criticisms may be true in certain cases, individual responses aren’t being taken into account. There’s no denying that low-carb sweeteners provide few if any health benefits and should not make up a major part of anyone’s diet. Moreover, based on several personal stories that have been published online, it’s clear that for some people these sweeteners do cause carb cravings, gastrointestinal distress, or other unpleasant side effects. However, for others, sugar substitutes may enhance the eating experience and make it easier to remain consistently low-carb. The myth that all low-carb sweeteners are bad needs to be put to rest. It makes perfect sense to avoid all sweeteners if you don’t tolerate them well. But if you’ve found that sweeteners don’t seem to affect you in a negative way and you plan to continue using them, make sure to choose one of the best keto sweeteners that won’t have adverse impacts on your weight loss efforts, blood glucose control, or ketone levels (especially if you’re following keto for therapeutic purposes).